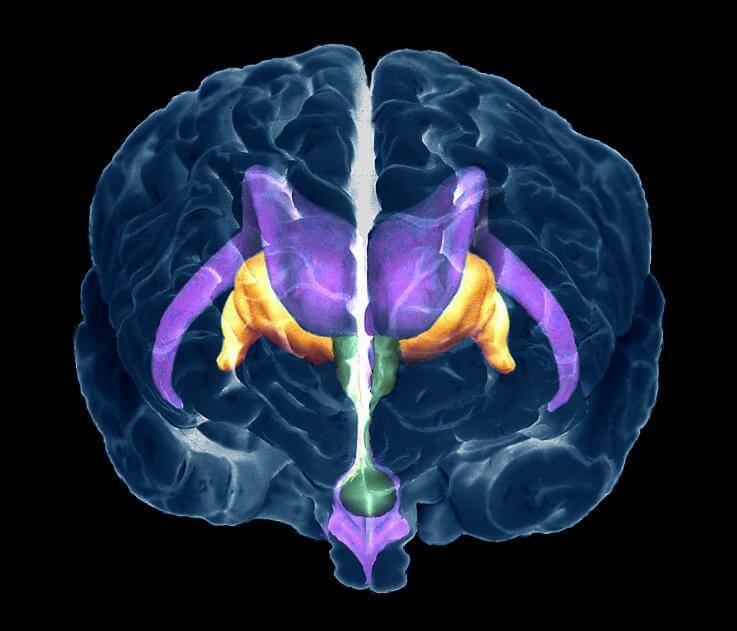 In this coloured 3D scan of the human brain, the green central structure is the hypothalamus. In response to circulating oestrogen, this releases chemicals that prompt the pituitary gland (green area at bottom) to in turn release hormones that trigger ovulation. Like many women, you may sometimes feel ruled by your hormones, and it helps to understand why they fluctuate. The hormone build-up to ovulation starts right now in week one of your menstrual cycle. Your pituitary gland, which lies at the base of your brain, produces follicle-stimulating hormone (FSH). During your period, the level of FSH rises steadily, triggering the development of the follicles (around 15–20 each month) in each ovary. As well as containing each egg, the follicles produce oestrogen. The hormone oestrogen circulates, affecting the pituitary gland and causing it to produce luteinizing hormone (LH) – this triggers ovulation. This week your oestrogen levels are low and steady, but will rise dramatically later in your cycle. Progesterone levels are low during your period, but start to rise several days afterwards and stay high for the second part of the cycle. Under the influence of progesterone, the muscles in the cervix relax, easing open the cervical canal. Changes also affect the mucus, which becomes more fluid, so sperm find it easier to swim through. It is progesterone that enables the lining of the uterus to thicken in preparation for implantation of the fertilized egg. There are four hormones at work during the menstrual cycle: FSH (follicle-stimulating hormone) causes the egg follicles to start developing in the ovary; oestrogen is produced by the developing egg and peaks just before ovulation; LH (luteinizing hormone) triggers ovulation; and progesterone thickens the lining of the uterus. Scientists have confirmed there’s a male version of PMT – Irritable Male Syndrome. Mood swings, temper tantrums, and loss of libido in men were found to be caused by falling levels of testosterone due to stress. Rooted in folklore, these fertility tips require a leap of faith and a good sense of humour! Exponents of “lunaception” believe that women whose menstrual cycle aligns with the lunar cycle – so they menstruate during the new moon and ovulate when the moon is full – have more chance of conceiving. It’s based on the theory that women’s cycles are influenced by natural light. Maypoles are thought to herald the arrival of spring and celebrate fertility. I m in 30th week.. my doc dsnt recmnd me for secon..
Hello mam I'm 13 ek pregnant.. frm last two days I.. I am in 35th week and in my scan got to see bod an..
My lmp 1st Dec 2015.. as per scan my due date 6th..